Strengthen student writing and reinforce homophones with these FREE, easy, 3-tab foldable books--a useful addition to interactive notebooks or writer's notebooks! 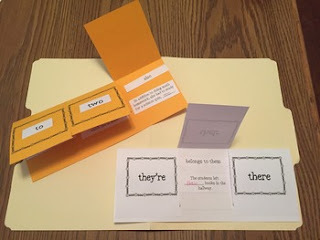 Students will label each tab with a homophone. Then, they will identify and paste the definition for the homophone underneath the correct tab. Finally, they will complete sample sentences with the correct homophone and also paste those underneath the corresponding tab.